For more than 75 years, the active ingredient in Amosan Oral Antiseptic Rinse has been trusted to help treat gingivitis, canker sores, denture irritation, tooth extractions, and other minor mouth irritations. Amosan Oral Antiseptic Rinse is a natural health product that is manufactured in Canada and licensed by Health Canada. 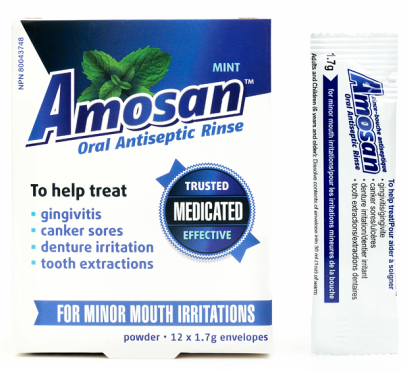 Amosan Oral Antiseptic Rinse is available across Canada at the following retailers: Shoppers Drug Mart, Pharmaprix, Pharmasave, Overwaitea, Guardian, IDA, Medicine Shoppe, PharmaChoice, Metro Pharmacies (Ontario), , Sobeys Pharmacies, London drugs, Lawtons Drugs and Thrifty Foods (B.C.). Mecca Ointment has been a trusted household brand for hundreds of thousands of families and more than a million people during the last 100 years. Mecca Ointment is used for temporary relief of pain and/or itching associated with minor burns, sunburn, minor cuts, scrapes, insect bites or minor skin irritations and for the temporary protection of minor skin irritations. 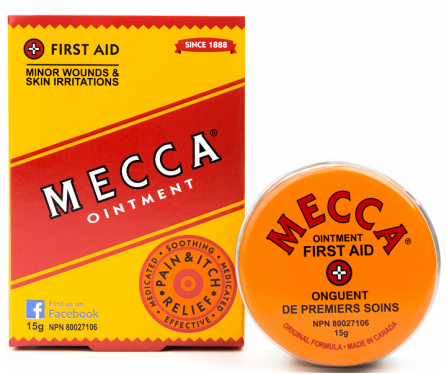 Mecca Ointment is available across Canada at the following retailers: Rexall, Pharma Plus, Guardian, IDA, Medicine Shoppe, Pharmasave, PharmaChoice, Metro Pharmacies (Ontario), Food Basics Pharmacies, Sobeys Pharmacies, London drugs, Lawtons Drugs and Thrifty Foods (B.C. ).